MADRID – US President Lyndon B. Johnson once said, “The presidency has made every man who occupied it, no matter how small, bigger than he was.” But Donald Trump is testing that maxim. In Trump, who is somehow managing to reduce the position to his size, America’s presidency may have met its match. The president of the United States – the position, not the person occupying it – is a pillar of the international order. The US presidency gives direction and guidance to the entire system, a kind of rudder that guides the world toward calm waters or, when necessary, through periods of creative disruption. With Trump in charge, that rudder is broken, and the entire system could be left stranded in dangerous waters from which it will be very difficult to escape, even after he is out of power. Indeed, the true risk of Trump’s presidency lies not in the dangerous conditions of the next four years, but in the emergence, in the long term, of a directionless – and thus highly unstable – world order. The erosion of the American presidency’s global role certainly did not begin with Trump’s inauguration. Trump’s predecessor, Barack Obama, brought a hyper-logical approach to foreign affairs, focusing on discrete areas where he believed the US had an interest and could make an impact. Yet he failed to account for America’s systemic role; as a result, he inadvertently reinforced perceptions of declining US global leadership. Obama, for his part, was reacting to his own predecessor, George W. Bush, whose tendency toward dangerous overreach was exemplified in his Global War on Terror. And that tendency did not start with Bush: the list goes on, taking us back a good century. Trump is often likened to other presidents. His recent firing of FBI Director James Comey, who was conducting an investigation into his campaign’s ties with Russia, and the Justice Department’s subsequent appointment of a special counsel to continue that investigation, has invited comparisons to the scandal-ridden final years of Richard Nixon’s presidency. And those who remain eager to give Trump the benefit of the doubt sometimes compare him to another Republican outsider who was initially viewed as a threat to the global order: Ronald Reagan. But Trump is no Nixon, Reagan, or anyone else. He is sui generis – a reality-show president optimized for sound-bite social-media politics. A uniquely gifted performer in the digital circus, he lacks the vision, consistency, and perceptiveness that today’s fast-changing and deeply interconnected world demands from its leaders. Perhaps most important, the questions he is raising are not about the US presidency’s direction, but about its very functioning. The mantra pushed by Trump’s handlers since his inauguration has been to look at what he does, not at what he says. We should ignore his impetuous accusations and relentless contradictions. We should have faith in the professionals by his side: Secretary of Defense James Mattis, Secretary of State Rex Tillerson, and National Security Adviser H.R. McMaster. And we should wait patiently for results, whatever they may look like. This approach only accelerates the presidency’s erosion. For starters, the accusations and contradictions that are supposed to be dismissed as just part of the show – or even as tactics that the public cannot yet understand – can easily become all-consuming, as US cable news continues to prove. The notion that Trump’s cabinet should offer solace to doubters is equally damaging. For one thing, there is the question of whether its members can withstand pressure within the administration. Judging by McMaster’s verbal contortions in describing Trump’s Oval Office meeting with Russian Foreign Minister Sergei Lavrov, in which Trump apparently disclosed highly classified ally-provided intelligence, this is far from guaranteed. This transference of responsibility also raises serious practical challenges. What happens, for example, when Trump’s words contradict those of one of the “adults” in his Cabinet? Just recently, after Trump asserted that South Korea should pay for the deployment of a $1 billion missile-defense system on its territory, McMaster called South Korea’s national security chief to pledge that the US would shoulder the costs. That stance is untenable. The US president is a singular voice in world affairs. Whatever erosion the position has suffered, it remains true that, when a US president speaks, people listen. That authority should not be wasted on outrageous tweets and rambunctious rallies. It must be used to cut through the cacophony of twenty-first-century international affairs and exert a stabilizing influence on the world. 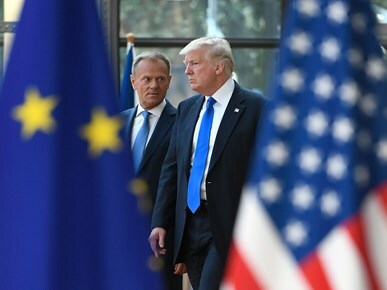 Trump’s unsettling performance came despite significant efforts by his hosts, especially NATO, to create an atmosphere that would engage and encourage Trump. They recognized that, at a time when institutions everywhere are straining to remain relevant, we cannot afford to lose a pillar of world order, simply because of the predilections of a small man. We must, therefore, do whatever we can to help Trump – if not to succeed, then at least to avoid crashing and burning. Of course, when Trump pursues a wrongheaded policy, we should resist. When he acts against the interests or values of others, we should push back. When he offends, we should defend. But the world cannot afford to sit back and watch the institution of the US presidency disintegrate.